Today I am supposed to sit in an area of the house where I rarely sit and contemplate on a problem area, envision the room empty, and rebuild that problem area in my mind, imagining how I want it to look and function. Can I just say here that there probably isn’t a place in my house where I couldn’t sit for hours doing this? Not even on my freshly changed patio and backyard. There’s always something that could be added, changed, something that could work better. I’m beginning to see that the January Cure, isn’t. It’s the 2015 Cure. Today, I have meditated on the Office/Outbox. While this room is being used as the Outbox, there’s nothing I can do to start the changes I need in there, but I can imagine them and begin the plan. It’s an odd rectangular room with one window, 4 bookshelves, a wall shelf, a double closet, a desk and a trundle bed. Even without the collected gleefus that’s been shoved in there from every closet and corner I’ve cleared, it doesn’t function well and it’s anything but attractive. I need it to function as a guestroom/office/craft room. It will need to accomodate a sturdy queen sized bed, craft table and computer desk. It will also need to be accessible to wheelchairs. Umm.. yeah. The second half of today’s assignment is to pick a project from my list to do this month. I’m ignoring their “this month, in about three hours” recommendation. I’m staking claim on the <insert heebie jeebie causing music again> Laundry Room. This room has been the number one problem in this house since the day we moved in. The laundry room is really a short hallway leading from the main house into the garage. It’s also the only wheelchair accessible point of entry to the house. It’s also where everyone enters when visiting. Why no one uses the front door I don’t know, but there you have it. The doors were build wide enough to allow for wheelchair access. 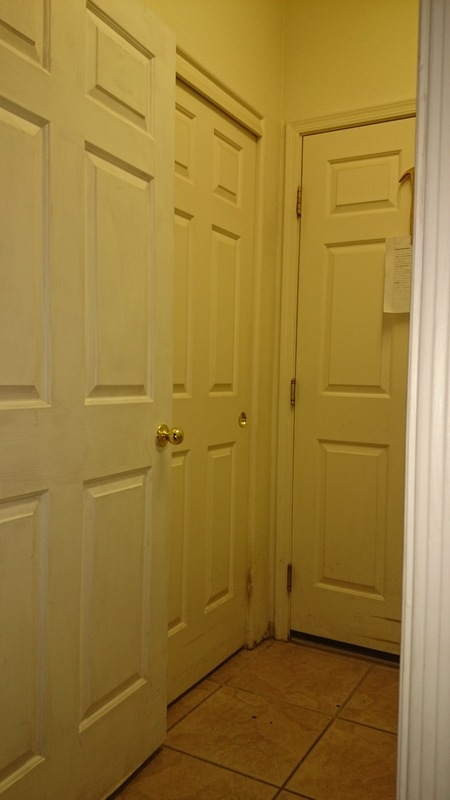 But the room itself is so short that when both doors are open they overlap and bang into each other. invariably knocking into the sliding double doors behind them which hide the laundry closet. With the front loading washer and dryer in there (I chose front load because it’s easier for me to get clothes in and out from my wheelchair), I can’t back up more than a few inches while opening either appliance without knocking one of the sliding double doors off it’s tracks. Bottom line, the room is a nightmare. This will be my month long, every spare moment, project. I have wood, I will build storage. My son and I build a backyard filled with furniture including a beautiful storage bench, I know we can insert a storage bench in the laundry closet. I have drills, I will remove doors. 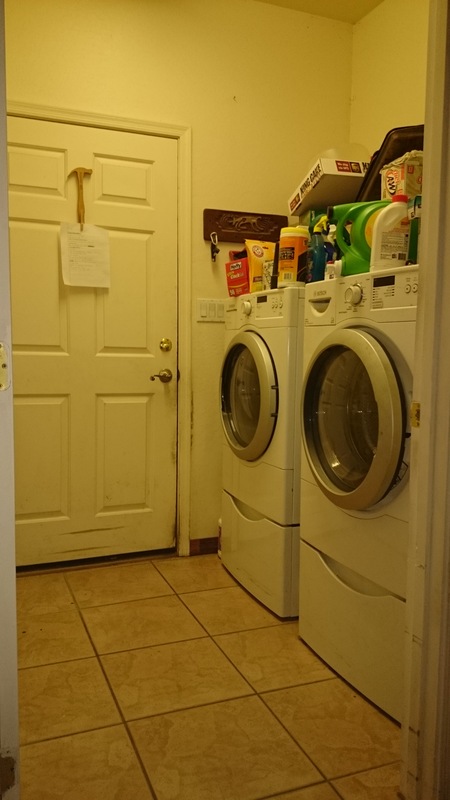 I have imagination, I will figure out something to cover the entry into the laundry room so that I don’t have to stare at the washing machine. I will build a better over head shelving system that actually works and that I can actually reach. The room will have a “landing strip” and a way to hang coats. All in a space the size of some walk in closets. Well, that’s the plan anyway! First I’ll get rid of the clutter. There’s a lot in there. Good things I’d use if I could reach them, but most of it is stuff I’ve long since lost the use for. John is home today and can reach the things on the shelves that are too high for me. This will be a clutter free area by the end of the day. Hi. Just found your blog via Apartment Therapy, and signed up for your emails/updates. I’m mostly in a wheelchair, too, and am looking forward to reading about your days, trials, and triumphs. The Cure will be fun! Welcome Carol! If you have any suggestions or need to brainstorm accessibility issues feel free to comment any time. Good to have you here. Yes, I’m deeply hoping The Cure will put me in a much better position to do the things I plan to do for the house and yard this year. I can’t add without subtracting and with so much disorganization in my life it’s difficult to start any other projects. Your laundry space is very similar to mine! Thankfully my doors don’t hit each other, but that’s probably because it’s a more narrow space. You definitely couldn’t fit a wheelchair through. I look forward to seeing what you do with your space!! Mine could use some love as well. I picked painting our upstairs trim as my “project”… I hate painting, and what I hate most is painting trim! The link to your blog came through fine in your second post. I loved your bedroom post! Good to know about the baking soda vs vacuum. I may do that just to see if it will kill my decade old vacuum cleaner possessed by the spirit of Ted Bundy. I want a canister vac that won’t fall over and beat me about the head and shoulders if I try to vacuum more than two feet away from it. While the current evil vacuum from hell still works, however, I can’t justify the expenditure. Yes… I was excited about texting Mom to tell her I’d used her gift, and then was suddenly horrified at the thought of having to call her and tell her I’d busted her gift on the first use. Thankfully after the recommended hour cool-down period it was working just fine!